Cooking from a Cookbook Challenge, an event that happens every weekend at +srivalli jetti space. We cook a recipe from a cookbook/magazine. From this year onwards, we planned to take one cookbook for a month and cook 4 recipes from the same book. In this genre, i picked up Chandra Padmanabhan's Dosai Book. You must think i m joking, yes there is a book on Dosai. You won't believe the varieties of Dosai featured in it. 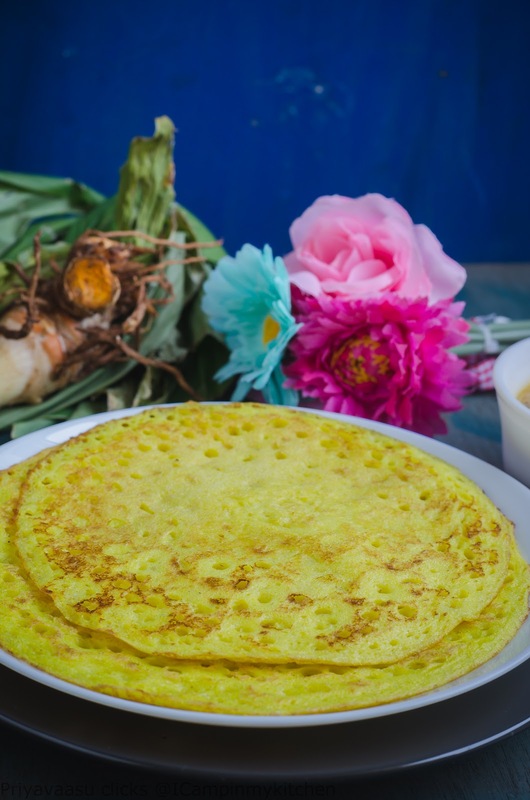 The first recipe that caught my attention is this Fresh Turmeric Dosai. The color and aroma of this dosai is simply scintillating. Fresh Turmeric has its own unique aroma, which reflects in this dosa as well. When paired with a spicy chutney and sambar, this is one colorful breakfast one can enjoy. The author says, this turmeric dosa is served on Diwali day by Tulu Brahmins of South Karnataka. Turmeric has nurmerous health benefits from lowering Cholestrol to preventing cancers. 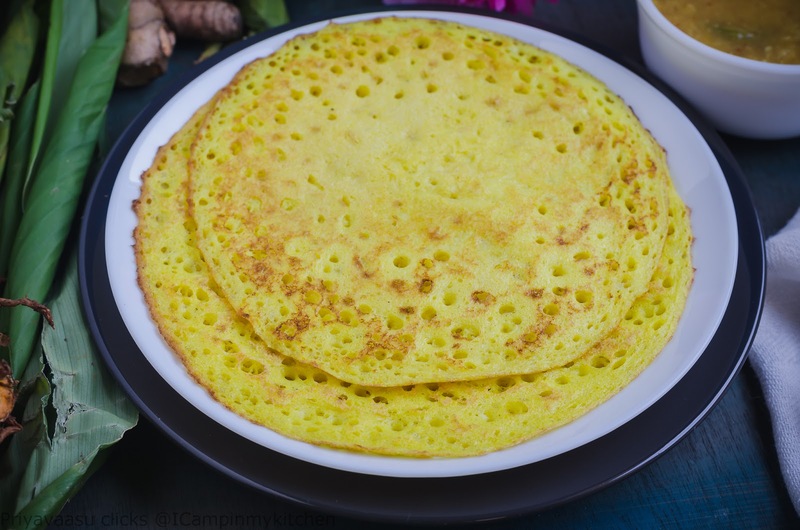 With fresh turmeric available in abundance during this season, try this dosa and enjoy the earthy flavors. Wash and soak rice and dal separately. Soak the fenugreek seeds along with urad dal. Let this soak for 3 hours. After the said time, drain the water from urad dal and grind it to a fine batter in a grinder. It takes almost 20-30 minutes for the dal to grind to a fine, aerated batter. The batter makes a 'cluck,cluck' sound, the sound of a well aerated, fluffy urad dal batter. Remove the batter to a clean vessel. Now drain and add the rice to the grinder, add the fresh turmeric root along and grind it to smooth batter. Once it is done, remove the batter to a clean vessel and mix both the batter together. I normally add the ground urad dal batter to the final round of rice batter. So both the batters get mixed well in the grinder itself. Remove the batter to a clean vessel, that is wide enough, to hold the fermented batter. Fermentation will cause the batter to raise a bit. Let the batter sit overnight or atleast 6-8 hours to ferment. After the said time, remove the necessary batter for making dosa to another vessel and refrigerate the remaining batter. Add salt to the batter and mix well. Heat a flat tava/dosa pan, add a dab of gingely oil and wipe it well on the pan with a paper towel. Pour a ladle of batter in the center of the tava, and slowly spread it circles usign the back of the ladle. Dot the edges with gingely oil, let it cook on one side for a minute or until the edges turn brown. Flip and cook on the other side. Serve it hot with any chutney/Sambar of your choice. That is a very interesting and nutritious dosa with turmeric. Love the color. Lovely color. Interesting addition of fresh turmeric to dosai, Priya.